5th-Class | St Brigid's Boys' N.S. 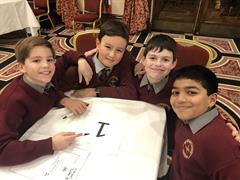 Well done to our Junior Quiz Team! Congratulations to both our quiz teams! The boys in Junior Infants enjoyed a lovely autumn walk to St. Brigid's park with the 5th class boys as their buddies to celebrate Friendship Week! St. Brigid's Junior Team are 2018 Champions! Stick Insects in 5th Class!